OMG! I have been collecting these fabulous Fendi Peekaboo bags since 2009! It's just the perfect size for everyday uses! I, like many of our readers we all has many "Baggage" and need a big bag to fit all of our junk haha. 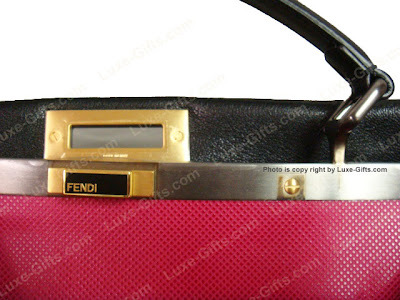 Today I just received my new limited edition black & hot pink fuchsia color leather lining peekaboo today! Which I will do a little show and tell later on in this post. 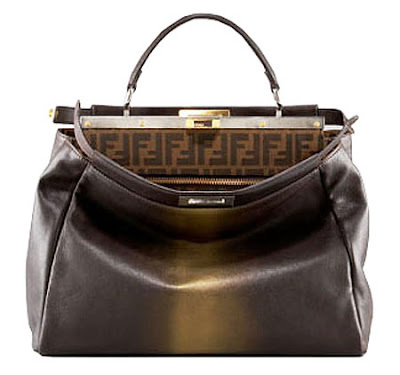 This limited edition Fendi Peekaboo will instantly adds a hit of luxe to your ensemble. Team it with sharp tailoring clothing and leave the bag open as shown in the runway to show off the fabulous Hot Pink color leather lining! Tres chic! 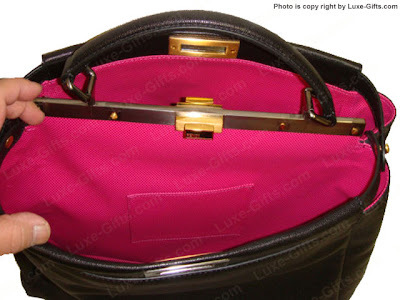 Black leather bag with limited edition Hot Pink leather lining is so hard to find! it was first release in fall 2009 it was all sold out within weeks. Now they just released a few of this limited edition peekaboo to some stores and it's already been SOLD OUT again!. 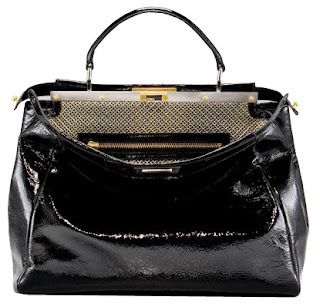 Fendi bag has a detachable shoulder strap, top handle, metal hardware turn-dial to fasten, a contrasting leather lining, multi compartment for storage and has press studs to fasten at the side. 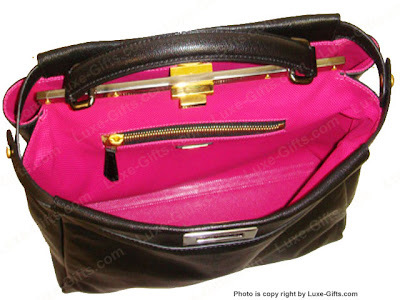 • Black leather outside with HOT PINK leather lining inside. • Goldtone and silvertone hardware. • Top handle with rings; 4 1/2" drop. • Framed top; turn-lock closure. • Textured HOT PINK leather lining. • Two interior pockets; one zip, one open. • 12"H x 16 1/4"W x 6 1/2"D.
Something about the fuchsia hot pink color just makes me happy! It's a perfect contrast to the sophisticated black color on the outside! The bag is big & unisex enough for a fashionable man to carry,too! I am using it as my work bag to carry stuff to my design studio, I just love it! 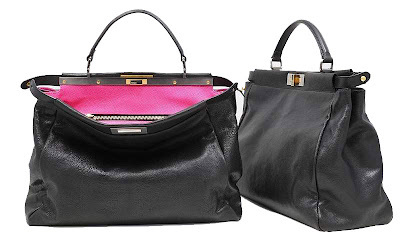 If you are also on the lookout for a fabulous Fendi Peekaboo bag, there are a couple online stores that have it, so get it while it's still available! Now, grab your bags and rush to the Fendi Boutiques or departments stores and get yourself a Fendi Peekaboo! it's a must have! Untill next time, be well and look fabulous!